Talk, Talk, and more Talk! End of the academic year once again, and this week has seen us gather as a staff to discuss where we’re at and where we’re going collectively as a Department, and individually as workers within the group. Two and a half days of navel-gazing, planning and wishing on stars resulted in a surprisingly consensual assembly. There is no doubt, after the costing exercise, that the practical courses are costing us. although the “loss” needs to be seen as an “investment” and panic ought not to drive us into cutting what we do best in order to meet the economic rationalists in the back rooms. Our call to action is a determination to continue to work in the most efficient and fiscally responsible way possible, though there must be an acceptance that in our sector of the creative arts locally, nationally, and internationally are not ever going to make money for their organisations. During the staff retreat I found myself agreeing to direct a production of Carol Churchill’s fantastic Mad Forest in Semester 1. I’ve somewhat reluctantly agreed to this and traded off my second year classes and a production of Black Box Shakespeare later in the year. I should have driven a harder bargain and traded off some more, but perhaps that would have been a little less collegial than expected! Now I have to get into prep for another show, work on the sonnets, and bring Black Box: All’s Fair … back to life. Oh my, the life creative is a busy one. On the personal creative front I’m enjoying learning more about digital photography and having fun with my new Nikon D-40. Took it along to the Faculty Christmas party on Thursday afternoon and grabbed a few happy snaps. So nice to have all those pixels to play with when editing; you can go w-a-a-y in, crop and still get the brilliant clarity that the lens provides. I’m going to have to spend the summer learning how to drive my newest toy, but given the locations I’m visiting, that should be neat! Now for some time I have been feeling extremely guilty about the way my bush garden has been going to pot. And it’s all down to the ongoing drought here in Australia, my lack of time. I’ve been assuaging the guilt by telling myself that I would be away for some of the hottest weeks of the year, and so this year, there was no need to plant, and it’s true. The drought is wreaking havoc; everything seems dry and lethargic, and I’ve been in no mood to pour what rainwater I have harvested onto ground that is not going to do much with it–which is why I have taken to pot gardening in a big way. At least I can control the feeding and watering. 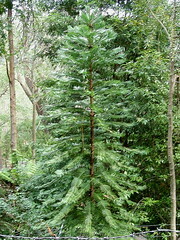 One of the native trees I’ve been hearing about for some time now is the Wollomi Pine, the fabled “dinosaur tree.” It was long thought to be extinct, but was actually growing away very happily and secretly in a national park outside Sydney. An abseiling botanist discovered the last stand of these beautiful trees from which seeds and cuttings have since been taken. The trees are now available for sale in Australia, but the original location remains a secret as it should. Feeling a bit flush with my Christmas leave loading, I decided that this year, I would get one for our Christmas tree. I went hunting this morning, and found a little stash at a local nursery. $99.95 later, with certificate of authentication, a very smart wrapping around a 1m high specimen in biodegrable pot, I now have a Jurassic Christmas tree of my own. It is a beautiful specimen, delicate and robust at one and the same time: the young growth is soft and lime green, the mature leaves blue-green and tougher, and apparently the bark gets “bubbles” as the tree matures. Wollomis do equally well in pots and as specimens in the ground, but for now, mine is going to be potted and live on the deck for a while. You can read all about them at the official site of the Wollomi Pine.